THE FIRST ONE EVER, ANYWHERE! HotShot crossed over the Rainbow bridge on 6/6/2014, rest in peace our sweet boy, you were one in a million and your legacy will live on via your offspring. 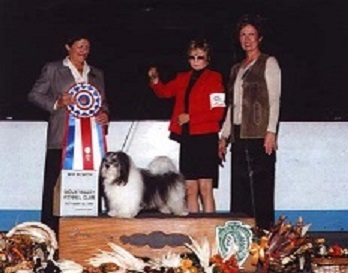 We, at TAPSCOTT'S BEST IN SHOW HAVANESE , are striving for Excellence and cutting no corners to achieve it. WE BREED FOR THE PRESERVATION OF OUR BLOODLINES!!! 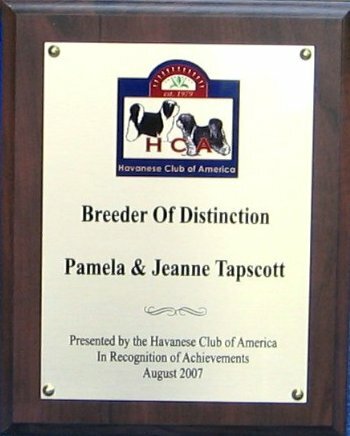 When looking for that new puppy, whether it be for a loving Companion only, or that possible next show dog, go to the Havanese Club of America Breeder Referral site, that is the place to find reputable breeders who are in it for the dogs and not the money, as Commercial breeders and back yard breeders ALWAYS are!!! We are a Certified Hobby/ Show Breeder and comply with those regulations. We are NOT A COMMERCIAL KENNEL AND NEVER WILL BE! Our dogs live and love 24/7 with us, in our home as valued family members and NOT as breeding machines, hence why we screen our buyers so carefully. We do NOT ship, we do only face to face sales, but do accept deposits to hold a puppy, but pick up must be done in person. We supply forever support to all of our puppy buyers! We have raised, shown and loved dogs for over FORTY years and have watched newbie after newbie enter our breed for all the wrong reasons. Anyone who goes into dogs to make money, is either a Commercial Kennel..aka Puppy Miller, or delusional. If you do it right, with the dogs as your main focus...you will not make much money, if any. Not all dogs were meant to be Champions, this has no bearing on their quality, at least for us. In order for a dog to be a successful show dog, they have to be literally comfortable in their own skin and strut their stuff at the dogshows. 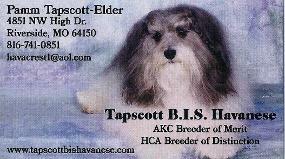 All Havanese at Tapscott's are health tested, and certified with OFA, none are ever bred that possess genetic problems. Though some may be lacking a Ch. in front of their names, in our family, this does not reflect their quality, nor lack of it. Some dogs were obtained older, or else simply had no interest in the world of competition. Do not be mislead by breeders stating they only breed champions, as a professional handler can finish the titles on anything. We Show our own dogs and if it is something they hate, then we do not force them to do what they hate to do, as we love them too much to make their lives miserable. WE BREED FOR QUALITY AND NOT QUANTITY, and our record reflects this fact. So when looking for that special puppy do not look for only CH. titles on the sires, nor dams, as that does not insure they are top of the line. We are NOT a kennel, our dogs live and love 24/7 in our Home with us, as valued family members.We breed for confirmation, temperament, and health, as feel it takes all three portions to make the whole dog. There are no questions we won't answer, so please ask us anything, we believe in total, full disclosure ALWAYS! Be sure to check out the breeders, do NOT buy from breeders who are NOT members of the Havanese Club of America, do NOT buy from USDA licensed kennels and do NOT buy from breeders who take credit cards, these are living little fur KIDS, and deserve to be raised as such! Beware of dogs that are being sold as Tapscott Havanese, unless we are listed AS THE BREEDERS, they are NOT Tapscott dogs, it is just a ploy being used to sell dogs resulting from dogs that we would never have blended into our hard worked for lines.